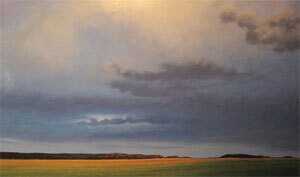 Jeff Aeling, Afternoon Cumulus, Oil on Board, 34" x 48"
Reprinted courtesy of Western Art Collector Premiere Issue 2007. 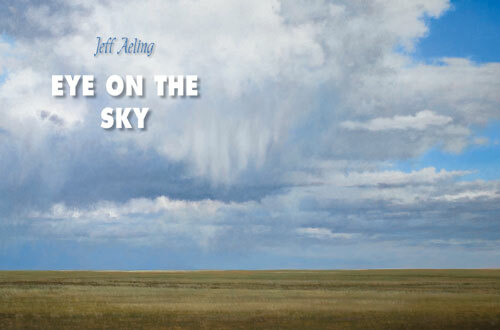 Jeff Aeling is a man who knows what he wants to paint. “The White Bluffs is an area south of Galisteo, south and east of Santa Fe by about twenty miles. It’s one of few areas left that still has original adobe structures. It’s a big basin and it has some wonderful views where you get out south of town and go up a series of sloping hills and you can see north clear to the Sangre de Cristos. Jeff Aeling, Twilight, White Bluffs, New Mexico, Oil on Board, 48" x 72"
“There’s one spot that I go to that goes right through the village. Three or four miles out of town at the top of the hill there are two cattle gates. I pull off the road and there are four different views I use. I go out there late in the last hour to hour-and-a-half of light and I watch the change as the sun goes down. “As far as the compositional formats go, there are three or four views from that area. The Galisteo Basin to the north with the Sangre de Cristos in the background, the White Bluffs to the east, west is the Cerropellon—a grouping of hills, and to the south is a view of the Comanche Gap—a basaltic rock formation. That’s a volcanic structure with a gap in it. I guess it’s like Cézanne with his mountain; I just find myself going back to that place again and again. The weather is always very different. 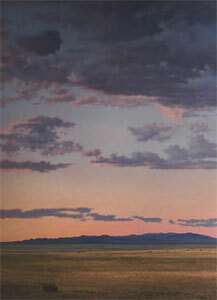 Jeff Aeling, Sunset, San Cristobal, New Mexico, Oil on Panel, 72" x 48"
“The main reason I like New Mexico is because there’s such a sweep and expanse to the landscape and there’s such a huge sky. The weather and the landforms themselves are so intimately connected. You find examples of how the very large and very small relate to each other. You can see very clearly what happens with the clouds, the sky, the weather and how it affects the land. After a while you find great similarities between what you find in the sky and what you see in the land. Ideally, you feel a sense of connection, that you’re not separated from the natural world and all those processes that happen in it, happen in you, yourself. There’s something nice in the hugeness of those vistas. You have a sense of just how tiny you are in the larger scheme of things. All those shapes and forms you have in your own body. Even though you’re tiny, you have significance. You’re a part of it. You’re a microcosm of it. Nature responds to physical laws no matter the size. 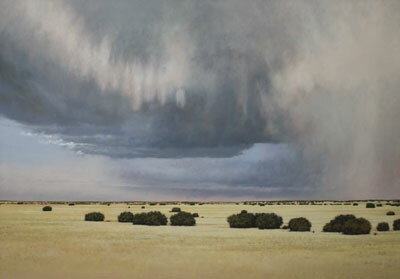 Jeff Aeling, Hail Storm East of Cerrillos, New Mexico, Oil on Board, 34" x 48"
Aeling is always gratified when collectors understand what’s behind his paintings. “Some of the people that have collected my work are very young, and some ofthem are older. Down at Tucson I was at a show one time and I had a couple come in. They were astronomers and they were studying galaxies. They got it. They understood that the same activity they’re engaged in, I’m engaged in, in my own way. Whether or not people understand the specifics of what the work comes out of, they can get a sense of it, even if they can’t articulate it. 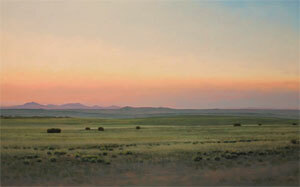 Jeff Aeling, Sunset West of Lamy, New Mexico, Oil on Panel, 18" x 30"
“You do the work and you hope that people find something in it that they can relate to. I like that people find something in the work that they respond to and want to take home to live with it. It’s about taking a long look at something. The very act of making a painting is meditative. You have to hold whatever it is that you’re painting in your mind. The very process of making it go from your mind, through your hand, and onto the panel. I think they’re responding to that. They want to take it home and share in that experience. Jeff Aeling, Afterglow, Cerro Pellon, New Mexico, Oil on Board, 18" x 30"
“What collectors need to know is that I’m just a landscape painter. 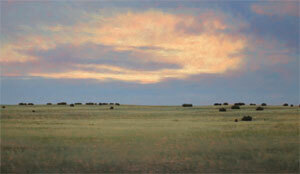 I see myself as another guy in the line of American landscape painters. I’m just trying to bring to it the knowledge that is currently available to me. All my favorite landscape painters were trying to paint it clearly with the knowledge of what was available to them at the time. Kensett was my favorite painter. I’m interested in the same sorts of things he was interested in, but I have access to satellite photography and the current understanding of nature. “The painting is always changing, but in ways that aren’t always immediately obvious to me. Others see it. To me I’m just painting, and I don’t think of it as being anything terribly complicated. I try to make the paintings as close as possible to the actual experience of being there and seeing. 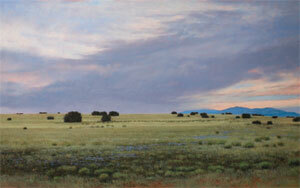 Jeff Aeling, Twilight West of Lamy, New Mexico, Oil on Panel, 30" x 48"
Aeling need not worry anymore about grants—his work is well-regarded by important collectors from around the country.